It is unique in that it is designed for use in electrics and electronics as well as metals and structures. 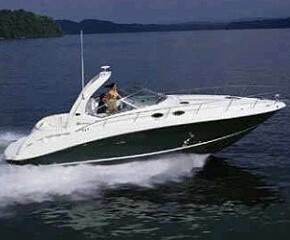 This makes this product essential for your day-to-day routine maintenance and as long-term asset protection for your boat/equipment within the harsh marine environment. It is a VERY sophisticated water displacement product designed as corrosion prevention and inhibiting compound with the added advantage that it will stop existing corrosion, prevent new forming and is slow to deteriorate (it has a 12 to 18 month active life). It is also a very efficient penetrant, without loosening structural attachments and an excellent lubricant, without having any wax, silicon or Teflon additives (which actually seal in moisture thereby aggravating and perpetuating the corrosion process). It is ‘pro-active’, neither passive nor waxy, is compatible with most plastics and is EXTREMELY ECONOMICAL IN USE. 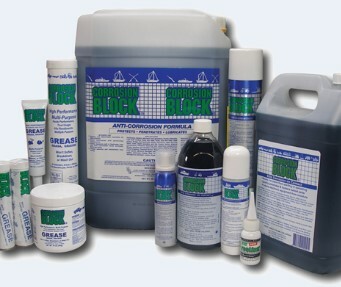 Corrosion Block is a proprietary package of additives in a slightly thicker carrier than ACF-50. The additive package makes Corrosion Block into a high-adherence creeping-fluid AND an outstanding de-watering fluid too. These properties mean that just a smallest amount will get into every crevice, every blemish of corrosion, utterly remove the water and stay on task, even under maritime conditions. 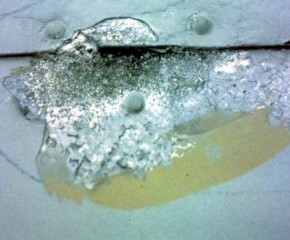 Removing water means stopping corrosion dead in its tracks. With the extra adhesion Corrosion Block stays in place for up to six-months, even in salt-spray, actively spreading, sacrificing itself to keep corrosion at bay. Corrosion Block is simply sprayed into the structure, joints and welds, i.e. under hidden areas, where the corrosion works away un-noticed, under panels and on hidden parts of the engine, gear boxes, generators, switch panels and avionics, especially on outboard engines where it will work hard to prevent corrosion and structural degeneration. Where corrosion is already evident it will help inhibit further progress by insulating and electrically ‘switching off’ the corrosion cell. It will also penetrate around bolts, screws and hardware, protecting them from electrolytic corrosion and preventing seizure. It will protect electrical joints, plugs and components and prevent corrosion causing high resistance joints. This goes for PCB’s and electronics as well, such as computerised ignition and fuel control units and their multi pin plugs, radio’s, radar and antenna’s, while switches, controls and levers will all be lubricated as well as protected from corrosion. It does not affect the working of electrical or electronic components however keep it off LCD’s. Multi pin plugs and connectors benefit from having Corrosion Block applied directly to the contacts. Corrosion Block has restored many a failed electronic/electrical component. It’s uses are unending, you will love it!